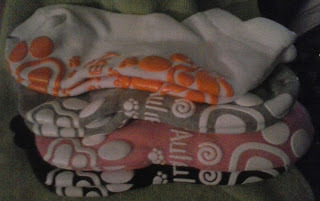 These Aulexy Women's Yoga Grip Socks come in assorted colors. There is one pair each of black, white, pink, and grey socks. These are a low cut sock that fits very nicely. They are snug, but not too tight. At the back of the cuff is a little tab that helps to keep the socks from slipping down into your shoes. The socks are thick and soft. They keep my feet warm without overheating. The best part though is the nonskid grips on the bottom of the feet. The pattern is big enough to provide a very good grip so there is no slipping and sliding even on the slickest of floors. Whether you are doing ballet, pilates, dance, yoga, or just walking around on slippery floors, these socks will help keep you from slipping. The non-skid grips work very well, and the socks have held up nicely to several washings. I am very happy with these socks and would recommend them to others as well.